Alessia Cara is one of the brightest, young pop stars of the last few years. She broke out in late 2015 with the release of her crooning smash hit “Here”, the lead single off her debut album Know It All. That song featured a unique perspective on parties and what it really means to be anti-social. The follow-up single off that same album was titled “Wild Things”, and was released in early 2016 with an accompanying music video. This track, much like “Here”, is a tribute to those that feel like outsiders. Alessia and her friends lying on a car. The song is a call for self-acceptance for those that feel like they don’t belong, or aren’t “normal”. Throughout the tune, Alessia urges listeners to embrace what makes them weird instead of changing who they fundamentally are just to fit it. While the song is lyrically in the same style of her smash hit “Here”, “Wild Things” is a more straight-up pop song, and is a much more fast-paced, percussive track. Cara has found her niche in these kind of coming-of-age songs, so it’ll be interesting to see how she evolves as an artist as she gets older. Cara’s friend wears black high top chucks in the video. The video starts out with a narrating monologue from Alessia, intercut with the names and faces of her squad of friends that will be in the video. 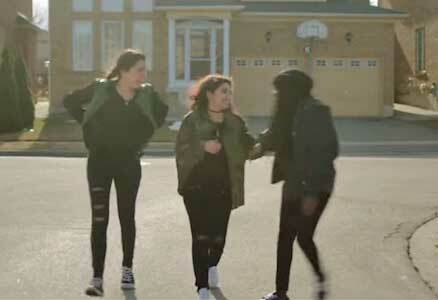 The video takes place in the suburbs of Toronto, where Alessia and her friends partake in a variety of activities. These include giving each other fake tattoos, and setting off fireworks on a beach. Cara’s friend Olivia wears a classic pair of black chucks in the video, and she’s seen in most shots that feature Cara. The video shows off the bond between Cara and her friends really well, which fits into the songs message about staying true to who you are. When a video really fits in with a song's message like this, it adds a much needed layer and makes the overall message that much more impactful. Stay true to yourself in a new pair of chucks by clicking on the links below.